The Fellowship was fortunate enough to obtain a copy of ALTERED STATES: VAMPIRELLA from Dynamite Entertainment. The story is written by Nancy A. Collins, art by Francesco Manna, colored by Viviane Souza, and lettered by Marshall Dillon. Ella Normandy is a crew member of the space craft Arthur Clark. They were on their way to Venus when they encounter an interdimensional gate that pulls them in. The ship crashes, killing two members of the crew of four. Escaping, Ella and the Captain quickly encounter a humanoid bat. Ella kills it, but not before losing the only other member of the team. Ella saves a couple of men from other bats and is given food and shelter. She is informed of the planet’s history and the current situation, which is now made even more complicated by her arrival…and a sudden revelation that could get herself killed! Alternate States is Dynamite’s alternate take of characters, similar to DC Comics’ Elseworlds books. I like these books, and this one was pretty good. Instead of Vampirella being an alien crashing on Earth and killing other vampires, she’s a human on Drakulon but has the same mission. Nancy Collins is no stranger to vampires or our heroine, and weaves a nice little sci-fi story here. If the rest of the one-shots are as good as this, we should have some fun here! 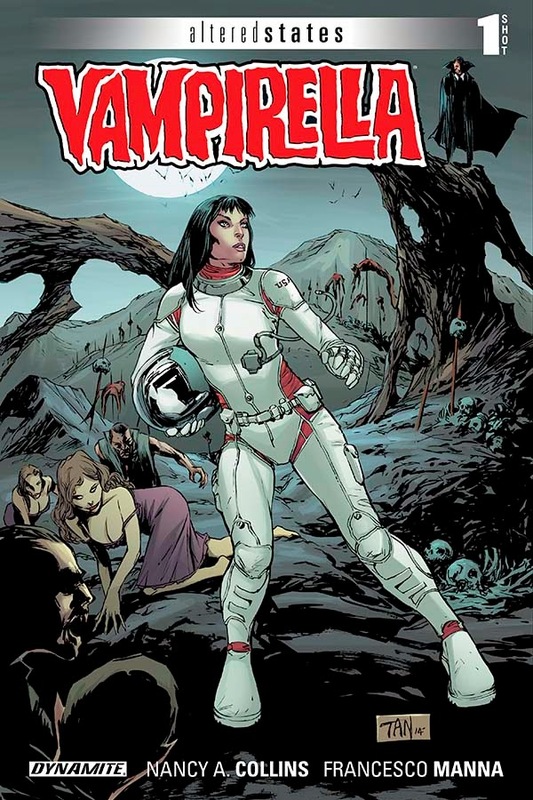 ALTERED STATES: VAMPIRELLA is in stores now, or available for ordering at www.dynamite.com.